Three years ago, when Lucia was almost 19 months old, she began to take her first steps. On average, most toddlers are walking unaided by the time they are 15 months, but some don’t walk until they are 17 or 18 months old – especially if they are bum-shufflers. Lucia was the queen of bum shufflers and could make her way around the house at lightning speed! But we do know that her Lymphoedema also more than likely held her back on the walking front as the soles of her little feet were so filled with fluid and we guess her legs probably felt heavy as well. Nevertheless, once she did get started she was the cutest little wobbler! However, three years ago we didn’t know whether she would walk properly, never mind run or dance. But now, we have a dancer in the house. Lucia started ballet classes a few weeks ago and it is already her most favourite thing in the world. I have never seen her as happy as when she is in that room practising good toes and naughty toes, riding unicorns, leaping like a frog, twirling and spinning and dancing on her tippie toes. Her face beams with joy for a full hour as she listens to her teacher’s every word and throws herself into every part of this wonderful new world. She counts sleeps until it is time for ballet and wakes up in the mornings asking, ‘is it a ballet day today?’ We’ve even had tears on a school morning because she thought it was a ballet day! It really has been an instant love. Lucia has always loved dancing around the house and had been asking to go to a ballet class. In the back of mind I had always worried that this might not be possible – for the simple reason that we may not have been able to get ballet shoes onto her little feet. Plus, we had to find the right ballet class with the right ballet teacher. We wanted a class where the teacher’s main aim was fun – especially at this age. Where the children’s most important role was to enjoy themselves. There are so many classes in our area but I just couldn’t find one that was 100% right for us and our girl. I then by chance heard of a class in our village – one who’s reputation preceded her as a kind and caring teacher, who is wonderful with the little ones, who gives them the right amount of encouragement but makes everything fun and exciting. So I rang her and had a good chat on the phone about Lucia’s lymphoedema and arranged to meet her one evening to see if, first of all, we could get ballet shoes to fit. From that first meeting we just knew that this was the ballet school for her. Sonia immediately made us feel relaxed and told us that Lucia’s lymphoedema wouldn’t be an issue – that she would be able to get her sorted. And she did. She had brought her bag of ballet shoes and tried a few different pairs on Lucia, being so gentle with her feet. She decided on a different sized shoe for each foot and although the one on her right isn’t the best fit because of the fluid on the top of her foot, Sonia was happy it would work ok.
As soon as Lucia stood down in her very own ballet shoes her little face was beaming – we went home and I’m not sure who was more excited, me or her! She didn’t want to take her ballet shoes off and was bouncing up and down the house. Thankfully, her first class was the next day so she didn’t have long to wait. Next morning, bright and early we headed off. Originally Lucia had asked me to sit in the hall and watch as understandably she was a little nervous – but in the end she didn’t even need me to (though I did stand outside and look through the window!). All the little dancers put their ballet shoes on outside the room before lining up for class. They also all bring a little toy with them which Sonia collects and sets on a table at the front of the class which is such a lovely idea. Then one-by-one she welcomes each girl by name, they hold their skirts out and run on their tiptoes to the back of the hall to start. And off Lucia went – with that huge smile never leaving her face. Every now and then she would give me a little wave through the glass, but mostly she was absolutely absorbed in the class. As you can imagine, I stood for an hour with tears in my eyes feeling like I could burst. I was so happy and so proud. So happy that her dream had come true, that I was watching my girl doing something that she clearly completely and utterly loved, so proud to see her starting this new class with such confidence, doing what the teacher asked and being just the same as everyone else. 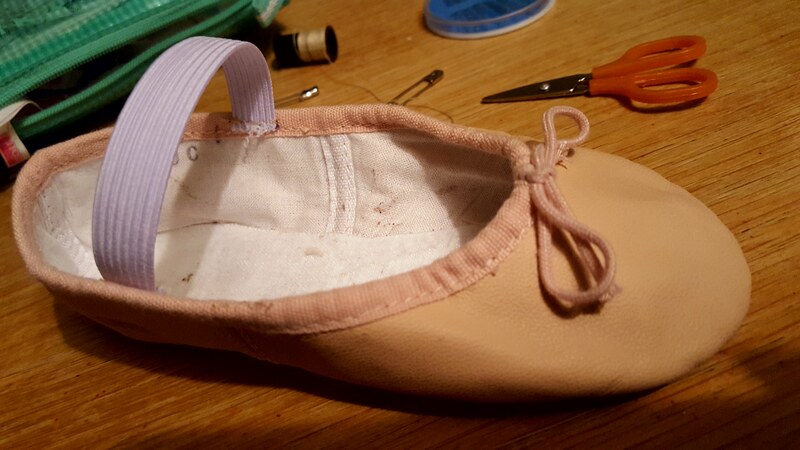 Essentially we need to reduce the swelling on the top of her foot as much as we can in this short space of time before ballet so her shoe fits a little better – and this is exactly what the toe glove does. Thankfully, Lucia is happy to get this on as she knows it helps. I also out on her right shoe as well to help compress the swelling a little. Then, when it is time to get ready, the shoe and glove come off and on goes her compression tights. Tights are part of the outfit so although Lucia’s tights are a slightly different colour and much thicker, they are fine to wear. It’s also really important that she wears them when exercising for her to gain maximum benefit. Then we get her converse on for further compression on the top of her foot so that by the time we get to class the swelling will have reduced a little since she first woke up. And of course, one solid hour of walking, running, skipping, dancing, spinning, tip toeing, leaping, jumping, pointing toes and more is wonderful for Lucia’s Lymphoedema as it gets her lymph moving. Ballet is such fantastic exercise for her condition as well as being brilliant for her health, fitness and confidence. Ballet shoes have elastic over the top of the foot to keep them on and after the first class had left a huge dent across her right foot. We could see the damage through her compression garments so we took them off and put her on toe glove again and after a few hours this finally settled. So during the week I bought some more elastic, removed the piece already on the right shoe and replaced it with a longer piece that ideally would still be tight enough to keep the shoe on, but not too tight so as to cause the damage to her foot. I was extremely pleased it did the trick and was so much more comfortable for her as well. 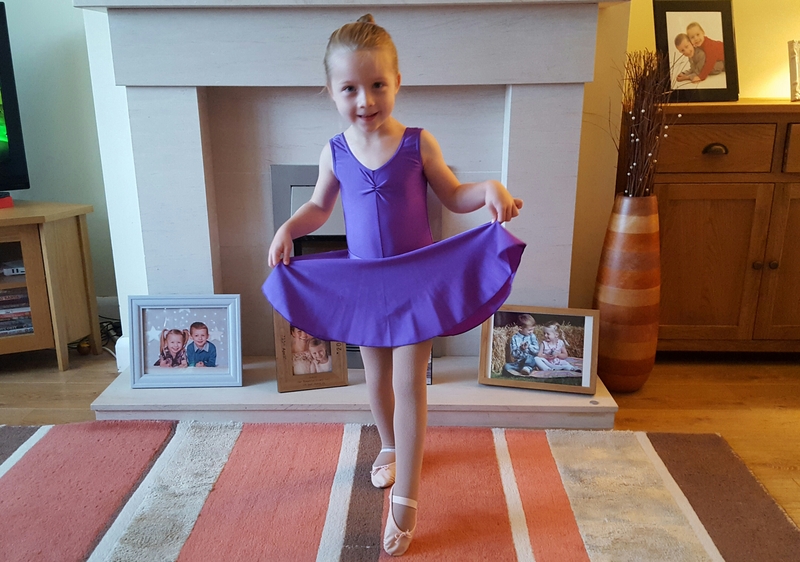 So September brought two big milestones – school and ballet – and although she is very tired and adjusting to this busy new lifestyle she is such a happy girl. And I am a happy mummy. I stay and watch her at ballet every week (I also usually go in and adjust her compression half way through the class) and I think my smile is as huge as Lucia’s. She has found something she loves and that is all we have ever wanted. It is all we ever want for both Lucia and Max – for them to be able to find something they love and most importantly to be happy. 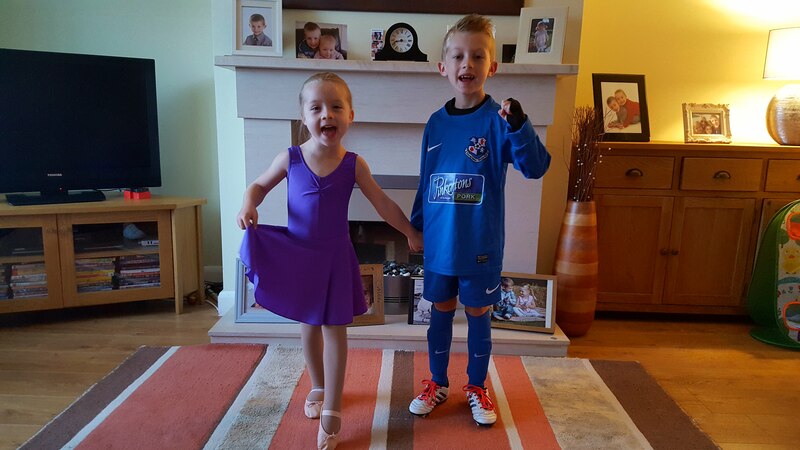 And right now, Lucia loves ballet and Max lives and breathes football and they are having so much fun. After ballet class, Lucia and I sometimes head over to meet Daryn and we all watch Max playing football – and he is in his absolute element, diving to make saves, chasing the ball, scoring goals and celebrating with his team mates. Our Saturday mornings have changed a lot – no more chilling in our PJs until lunch time! Long may it continue.